On being a White Faced Bird in a Brown Bird World or Where the Flock is my Flock? The little white-faced bird comes to the feeder once or twice every day. He comes alone and eats off the ground. When the other birds come, he flies away. Where the flock is his flock? I admit I don’t know much about birds and I’m projecting my human feelings on this little bird but every time I see him he tugs at my heart. Maybe there is a whole flock of white-faced birds just waiting for him somewhere. Maybe he is alone because he is different. Maybe this is why he touches me so. Sometimes alone is a choice, sometimes it is forced on us by others and sometimes it is a prison of our own making. 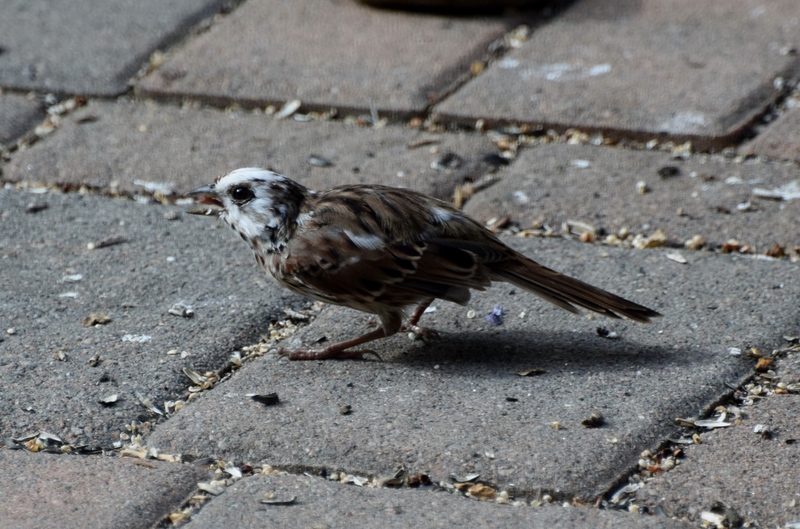 This little white-faced bird ( a leucistic sparrow) makes me think about my own choices and reasons. I know what he must feel like being a little different in a brown bird world. The little bird might be perfectly happy eating alone on the ground. Maybe he doesn’t like crowds. Maybe he is so special that the other birds are afraid of him rather than the other way around. Maybe he never has moments when he feels lonely. Maybe he never asks “Where the flock is my flock?”. I think I’m going to try to adopt that viewpoint.